Scientists from the Center for Advancing Electronics Dresden / TU Dresden and the University of Tokyo led by Dr. Thorsten-Lars Schmidt (cfaed) developed a method to protect DNA origami structures from decomposition in biological media. This protection enables future applications in nanomedicine or cell biology. The precise positioning of individual molecules with respect to one another is fundamentally challenging. DNA Nanotechnology enables the synthesis of nanometer-sized objects with programmable shapes out of many chemically produced DNA fragments. One of the most widely used methods in this field is called "DNA origami" which allows to fabricate nanoparticles with almost arbitrary shapes, which are around a thousand-fold smaller than the diameter of a human hair. They can be site-specifically functionalized with a large variety of materials such as individual protein molecules, antibodies, drugs molecules or inorganic nanoparticles. This allows to place them in defined geometries or distances with nanometer precision. Due to this unique control over matter on the nanometer-scale, DNA nanostructures have also been considered for applications in molecular biology and nanomedicine. For example, they can be used as programmable drug carriers, diagnostic devices or to study the response of cells to precisely arranged molecules. However, many of these artificial DNA nanostructures need a much higher salt concentration than that in bodily fluids or cell culture buffers to maintain their structure and thus their functionality. Moreover, they can be degraded quickly by special enzymes (nucleases) that are present in bodily fluids such as saliva or blood that digest foreign DNA. This instability limits any biological or medical applications. To overcome this deficiency, a team led by cfaed Research Group Leader Dr. Thorsten L. Schmidt (Technische Universität Dresden / Germany) coated several different DNA origami structures with a synthetic polymer. This polymer consists of two segments, a short positively charged segment which electrostatically "glues" the polymer to the negatively charged DNA nanostructure and a long uncharged polymer chain that covers the entire nanostructure resembling a fur. 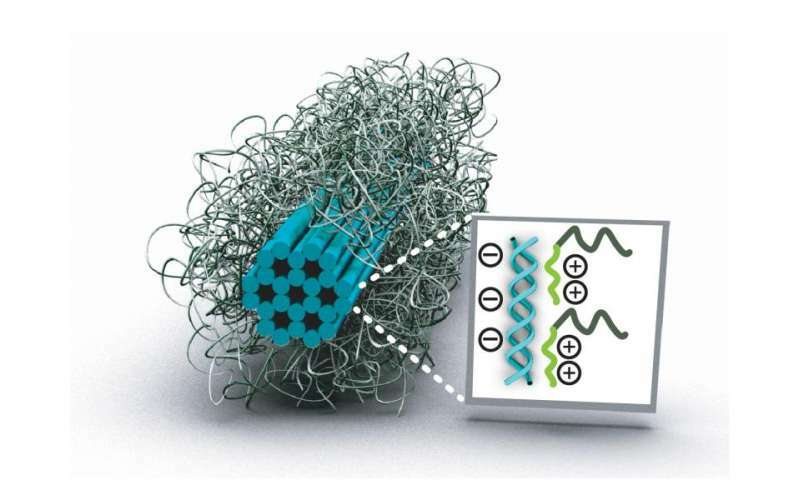 In their study "Block Copolymer Micellization as a Protection Strategy for DNA Origami" published in Angewandte Chemie [DOI: 10.1002/anie.201608873] they showed that such DNA nanostructures covered with the polymers were protected against nuclease digestion and low salt conditions. Furthermore they showed that structures functionalized with nanoparticles can be protected by the same mechanism. This straightforward, cost-effective and robust route to protect DNA-based structures could therefore enable applications in biology and nanomedicine, where un-protected DNA origami would be degraded.